Have you ever wanted to fly to the moon? Have you ever wanted to become a wrestler? Have you ever wanted to become a body builder? After watching the inspiring documentary co-directed by Sanjay Rawal, you realize that anything is possible as long as you set your mind to it. “Challenging Impossibility” premiered at the 2011 Tribeca Film Festival and takes us on the journey of a spiritual leader’s weightlifting career. At the age of 54, Sri Chinmoy made the decision to show the world that anything is possible if you set your mind to it. Without the body type or the age, Sri Chinmoy showed the world that you don’t have to look a certain way or be a certain age to take on whatever you wish to achieve. 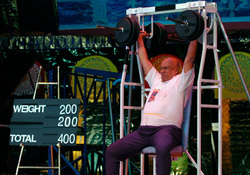 Sri Chinmoy's weightlifting defies belief. The documentary shows Sri Chinmoy lifting not only weights, but an aircraft, elephants, cars and a who’s who of 20th Century luminaries including Nelson Mandela and Sting. The documentary does an excellent job of sharing Sri Chinmoy’s vision and inspirational message and makes the viewer want to go out and challenge an impossibility!